Synth (Analogue / Subtractive) by XILS-lab5 of 13$159.00In My Cart! XR.A.M.S.E.S. At EastWest, we're all about the 'sound'; that's the only part that ends up in your track, so, in addition to the producer pre-mixed drum kits, we have included our favorite effects processors including Solid State Logic EQ and Dynamics, Transient Shaper, and the legendary SSL Stereo Bus Compressor; Ohmicide multiband distortion, compression, EQ and filter, which pretty much lets you create 'anything', and is perfect for EDM or media composers; plus EastWest's new Amp Simulator with 80 Amp Presets, and Expanded Convolution Reverb with 726 Additional Reverb Presets. Together these powerful tools enable user customization of the core sounds limited only by your imagination. Also included in each volume are over 14,000 MIDI drum grooves in different styles. Search for the right grooves for your song with our groove 'search engine' and assemble your song right inside ProDrummer with the built-in sequencer (or drag to your DAW). Use our built-in Velocity Processor to control the dynamic power of the drums. Export the song to your favorite DAW to build the rest of your track, it couldn't be easier. ProDrummer Volume 2 includes approx. 40 Gigabytes of Drum Kits and MIDI drum grooves produced by Joe Chiccarelli and multi-award winning EastWest producer Doug Rogers, with drums played by Matt Chamberlain (Pearl Jam, Bruce Springsteen, Peter Gabriel, etc.). 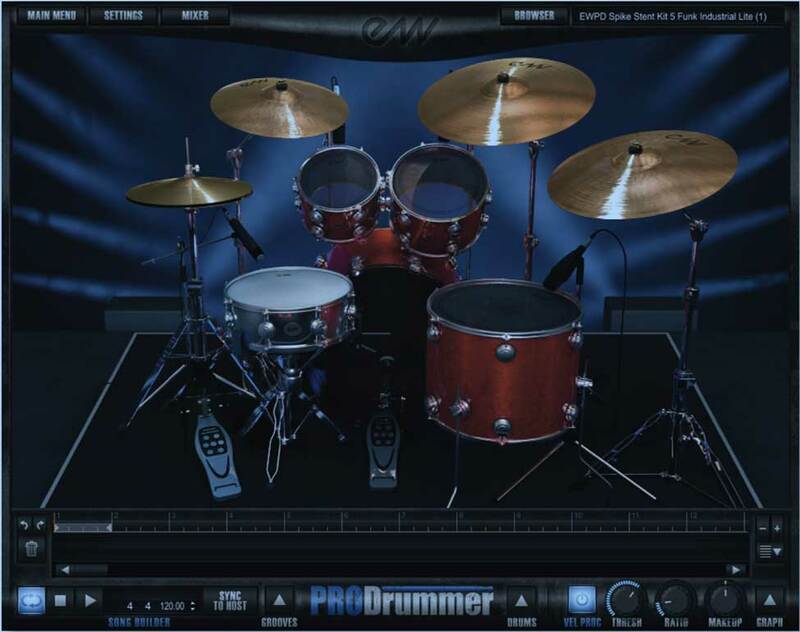 ProDrummer Volume 2 includes Craviotto, Ludwig, Tama, Slingerland, Gretsch, Istanbul and Zildjian, drums, hi-hats and cymbals recorded in 3 different rooms. The sound shaping options in the ProDrummer Mixer are unparalleled with the usual high quality you expect from EastWest. All drums have their own channels with individual processing and routing. "Makes it almost ridiculously easy to create a highly produced acoustic drum track. • Both volumes stand up well on their own and contain plenty of variety. • Room-specific mic channels and effects options make the sounds highly customizable. • MIDI groove library is substantial. • ComposerCloud subscription would be great for working professional composers". — Sound On Sound. 104 drum kits in both volumes. Over 100GBs of perfectly tuned drums performed by Steven Sidelnyk (Madonna, Seal, Massive Attack), and Matt Chamberlain (Peter Gabriel, Bruce Springsteen, Pear Jam). Recorded by the #1 mixer in the music business, Mark 'Spike' Stent, 10-time Grammy winning producer Joe Chiccarelli, and co-produced by EastWest's multiple-award winning producer Doug Rogers. Includes Pre-mixed user adjustable Drum Kits from the producers so the drums are ready to be mixed into your track. Includes over 14,000 MIDI grooves categorized by style, length, and tempo. 16 channel mixer enables complete control of each drum kit, bleed and room mics. Recorded in 5 studios from dry to very wet. The ONLY drum collection to include authentic SSL EQ, Compression, Transient Designer, and Stereo Bus compressor. Includes Ohmicide to create EDM or synthesize the drum sounds. Includes an Amp Simulator for further drum processing. Includes a State of the Art Reverb and 726 presets. 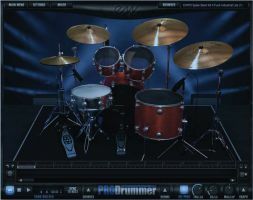 Includes a Songbuilder sequencer to arrange complete drum tracks inside of the ProDrummer software. Includes Sync to DAW to match the groove tempo in your track. Includes Drag and Drop to copy drums tracks to your DAW. Includes a Drum Velocity Processor and velocity graph to add punch. Includes the ability to swap individual drums within a kit, tune them and stack them (2 snares stacked for example). Sold separately or in a bundle at an unbeatable price.